So you think you have internalized the basic strategies of the game and know your way around? Good. This page will teach you some advanced techniques and help you understand the subtleties of game-play. In games with manual distribution of territories picking the right starting position(s) is essential. Especially ladder games require you to choose wisely. Prefer starting spots in smaller bonuses over those in large ones. Often a 3er completed in turn 1 is worth more than a 5er in turn 3. Aim for those bonuses first that can be completed in the least amount of turns. Don't just look for the starting bonus itself, also take further expansion possibilities into consideration. What will your income be in turn 3, 4 or 5? Sometimes even larger bonuses can be completed in a single turn when there are 2 or 3 adjacent starting locations. However, you cannot be sure you get all 2 or 3 of these spots, so in those cases you always need a plan B. Avoid bonuses with wastelands, at least in the beginning. Bonuses only pay off if they generate more income than you lost armies taking them. Example: A bonus worth 4 with 10 neutrals in it will cost you (neutrals x defensive kill rate) armies, say 10 x 0.7 = ~7 armies on average. It will pay off in the 2nd turn already. Taking a bonus worth 4 with 20 neutrals you may lose ~14 armies, so it will only pay off if you can hold it for at least 4 turns. Always place enough picks to avoid ending up with random spots. In a 1v1 with 3 starting spots you need 6 picks. In a 2v2 with 2 starting spots you need at least 6 picks as well, better 8 in case your teammate forgets about coordinating his picks with yours. In larger team games, always communicate with your team. On large maps pick a general starting area. The closer you start together, the less borders there are to defend. Mind your expansion capabilities though. You can check your teammates' orders and see where they intend to start: Click their name in the list, then click "View Teammate's orders". Once deployment has taken place if you didnt get any of your first 3 choices you therefore know that your opponent has these territories. Think carefully where you will deploy, this can determine whether you win or lose. Are you attacking neutral or your enemy(ies) or both? Will this affect your spread rate? How? Do you actually need to deploy there? Will your enemy(ies) attack you? Do you want to have enough armies to just defend from them or attack them? Approximately, how many armies will you lose? Timing is always of great importance. One single key attack happening too early or too late can turn your rock-solid victory into an embarrassing defeat. Your means of manipulating the order of events are the list of orders to the right of the game board and the order priority card and order delay card. Unfortunately the latter two are not always at your disposal, so primarily you have to concentrate on your order of commands. In most games, the kill rates are set slightly in favor of the defendant. So it is a very common situation that you want to delay an attack as long as possible, to make sure your opponents attack happens first (if he attacks!). To achieve that without an order delay card, you have to put as many dummy moves as possible at the top of your list of orders. Move some armies in the rear territories back and forth, or better yet bring them to the front lines. Attack some neutrals in the meantime. Just make that most important attack of yours the very last item on your list. When moving reinforcements from the rear to the front lines, move the biggest stack first OR reinforce the most vulnerable position first. When attacking neutrals, attack those where you do not expect interference from other players first, if your stack is just big enough to break the neutral. Try to delay those attacks on neutrals where you might encounter other players as much as possible, let your opponent clear those neutrals for you. Just make sure he does not see it coming. However, if you attack a neutral with a big stack, most often because you anticipate an encounter with a player there or because you'll knock at her/his bonuses, usually the sooner the better: this way any later move towards your freshly settled stack should crush onto your strong defense. The few casualties suffered breaking the neutral won't be as costly to recover as attacking second yourself on a supposedly equally powerful stack as yours. The analyzer tool is your best friend. It allows you to estimate if your attacks will fail or succeed and thus can give you a good first risk assessment. You can also use it to calculate the chances for multiple attacks combined, but since it only shows one attack at a time you will have to do some simple calculations yourself. You have 10 armies to deploy. There are 2 bonuses of equal value you could complete, but you only have armies for one of them. So you want to know the odds. You are missing 3 territories, each occupied by 2 neutrals. Since you have 10 armies at your disposal, you can attack two neutral territories with 3 armies each, and one with 4 armies. If you hover your mouse cursor over the dots in the upper graph of the analyzer tool, it will tell you the odds for each attack. 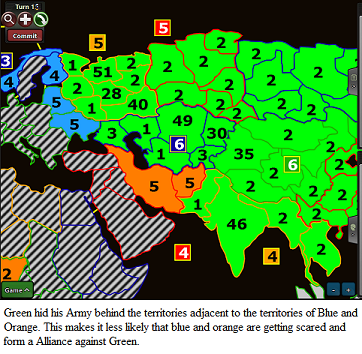 For a single 3vs2 attack there is a 71% chance of taking the territory. For a single 4vs2 attack the chance is 93%. You are missing 2 territories, one with 2 neutrals and the other one with 4 neutrals. So in this case the odds for completing the 2nd bonus are significantly better than for the 1st one. In large FFAs or team games it isn't all about the hard numbers. The impressions other players have of your relative strength are very important to strong-arming other players into alliances or avoiding coalitions formed against you. In fog games, taking special notice of the number of troops you deploy that are visible to each player is crucial to influencing other players' impressions. Reinforcements can also be deployed in territories non-adjacent to the enemy and then airlifted or transferred towards the front lines. In such cases you avoid giving the enemy an assured minimum on your income. This page was last modified on 18 February 2019, at 20:59. This page has been accessed 131,364 times.